In a perfect world, I would have chosen to prepare this casserole during the summer when fresh vegetables are abundant. But, who lives in a perfect world? I certainly don’t (hence the yellow peppers I used instead of red ones), but sometimes I want to eat something when I want to eat it. This recipe is full of the vegetables I have been craving after this long winter, yet it’s hearty enough to warm me up on still-chilly spring days. Don’t be put off by the rather lengthy ingredient list—these are commonly-available ingredients that just need a little prep. Then the whole thing is really just a matter of assembling the ingredients in layers. 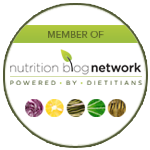 I recently did some research regarding the connection between celiac disease and Type 1 diabetes (read the post I did on this topic here) and I became intrigued as to what someone who has these two diseases might eat. 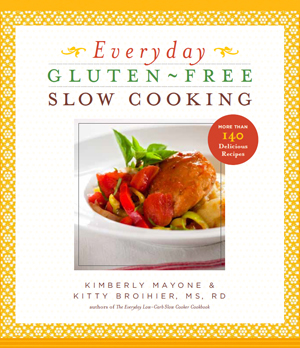 This recipe is not only gluten free, but can also satisfy the dietary needs of a diabetic. It just goes to show that even with multiple dietary issues, you can still take culinary trip to the Mediterranean in the month of March. 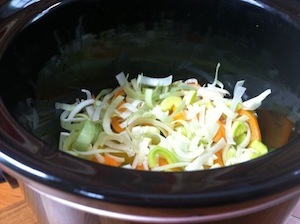 Brush the olive oil all over the inside of the slow cooker crock (leave excess in crock). Arrange the vegetable layers in the crock, starting with the zucchini on the bottom, followed by half the red peppers (set aside remaining peppers) and ending with the leeks. Set aside. 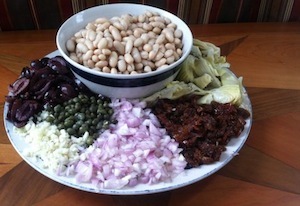 Prepare the bean layer: Stir together all the ingredients for the bean layer except the olives and broth in a medium mixing bowl until evenly combined. Spoon the bean mixture over the leeks in the crock; spread with a spatula to make an even layer. 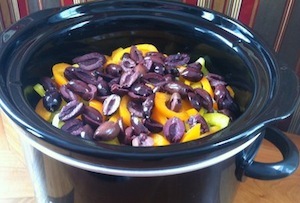 Placed reserved peppers over the top of the bean layer; then sprinkle with olives. Pour the broth over the top (do not stir). Cover and cook 3 hours on LOW. Remove lid and let casserole rest 5 minutes before serving. To serve, garnish by sprinkling feta over the top, followed by the chopped fresh tomato and basil.